Jamaica, NY, WPH Press, 7/22/18– The St. Albans Handball Association hosted the 2018 King of the Courts at Joseph Austin Playground, New York City’s third 1-Wall Big Ball singles “major” of the summer. 1-Wall #1 Timbo Gonzalez entered the 2018 King of the Courts as the defending champion with three overall titles at the prestigious NYC major and having captured the first two “majors” of the summer at the 2018 Battle of the Gladiators (HERE) and the 2018 USHA Wall Ball Nationals (HERE) and was aiming to continue his perfect season. 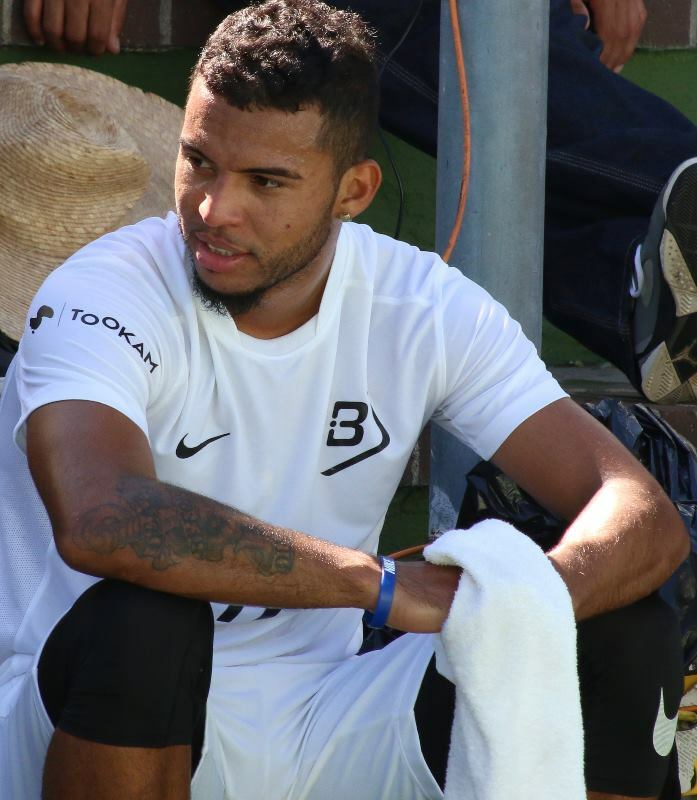 Gonzalez was joined in the 2018 King of the Courts by 103 players, to include 1-Wall stars Tavo Ruiz, Tywan Cook, Hector Velez, Carlos Pena, and Dan Pitre. Tavo Ruiz continued to shine in the bottom bracket, making the final by throttling Manny Sanchez in the quarterfinals and ousting rising 1-Wall star Iggy Accardi in the semifinals. After an hour of matching one another shot for shot, Gonzalez and Ruiz reached 22-all in the one game to 25 point final. Gonzalez appeared to sprain his ankle lunging for a shot to the right, facilitating a nearly 15-minute injury timeout. On the ensuing rally following the break, Gonzalez’s right thumb clipped Ruiz’s body on Gonzalez’s follow through, rendering Timbo’s right hand unusable for the remainder of the match. “My thumb just got pulled back and it was too painful to hit with it again,” stated Gonzalez. Ruiz took advantage in front of a boisterous and enthusiastic gallery that ran 10 deep on both sidelines and 20 deep behind the court, scoring two quick points to serve for the match at 24-22. Ruiz took control of what appeared to be the final rally of the match, driving a ball at Gonzalez’s feet to earn a setup that seemed to be nothing more than a guarantee to crown the new King of the Court. With Gonzalez moving to his right, Ruiz could have hit the ball to the left or into the open court to the right corner to win the match. Ruiz chose the right corner, and with an open court, missed, handing Gonzalez the serve. “Timbo gave Tavo a lollipop and all Tavo had to do was spike it to the left but I guess he felt he had something to prove by going for an inside-out right shot,” stated 2018 Florida Cup champion Hector Velez. With his thumb throbbing and ankle swelling, Timbo served out the match left-handed on the next service inning, scoring three consecutive points to defend his King of the Courts title and become the four-time King of the Courts champion. 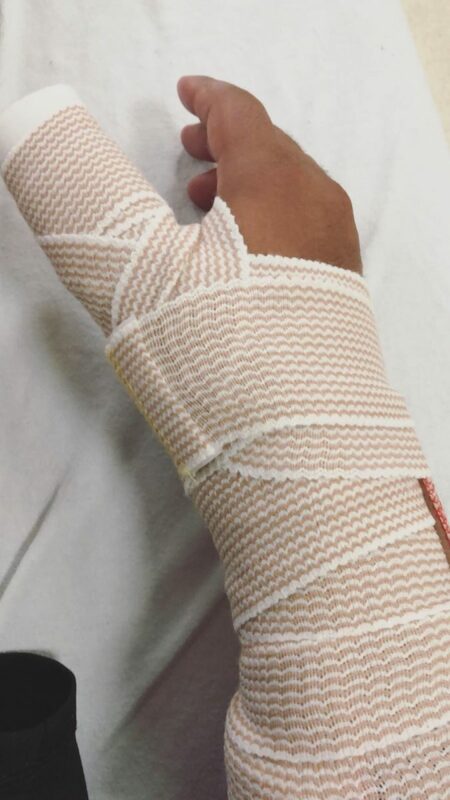 Editor’s note: Immediately after receiving his fourth King of the Courts trophy in dramatic fashion, Timbo was quickly taken to the emergency room, where he was diagnosed with a fractured right thumb. The World’s #1 1-Wall star was fitted for a cast and will be out indefinitely. “This is very, very painful,” declared Gonzalez from the emergency room.